I love the Leading Ladies series of stamp sets from Ellen Hutson. I could just imagine any one of the ladies relaxing while clutching her cup of coffee. I decided to adapt the Photo Lady to depict this in a card. 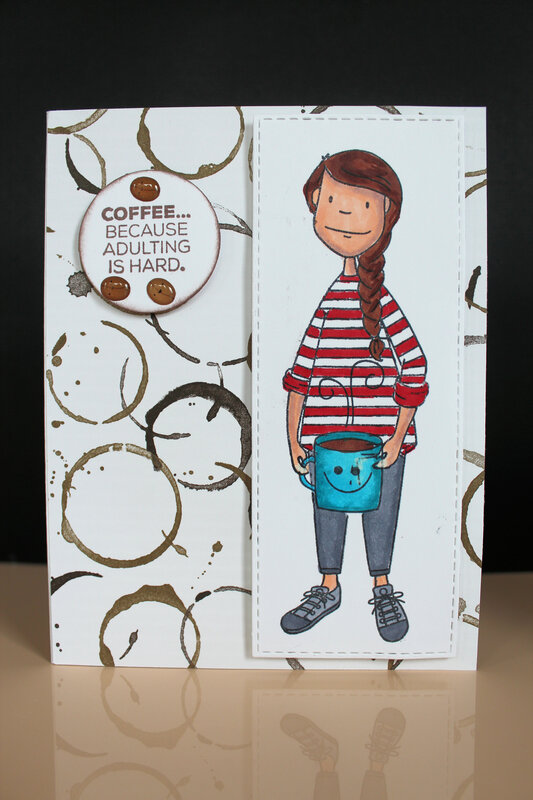 Patterned paper is from Stampin Up and the sentiment from Technique Tuesday’s Sassy Coffee. 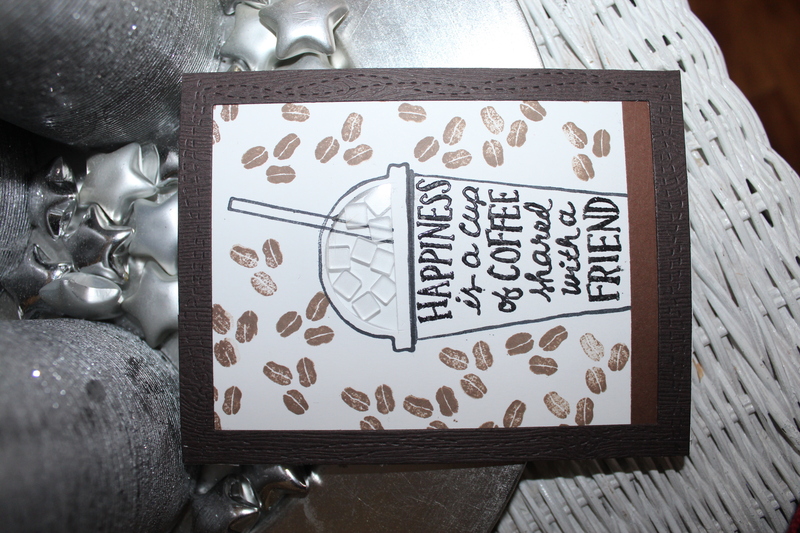 Coffee beans are from Doodlebug and the stitched mat is from My Favorite Things..
Today’s card just turned out so cute, that I couldnt wait to post it. 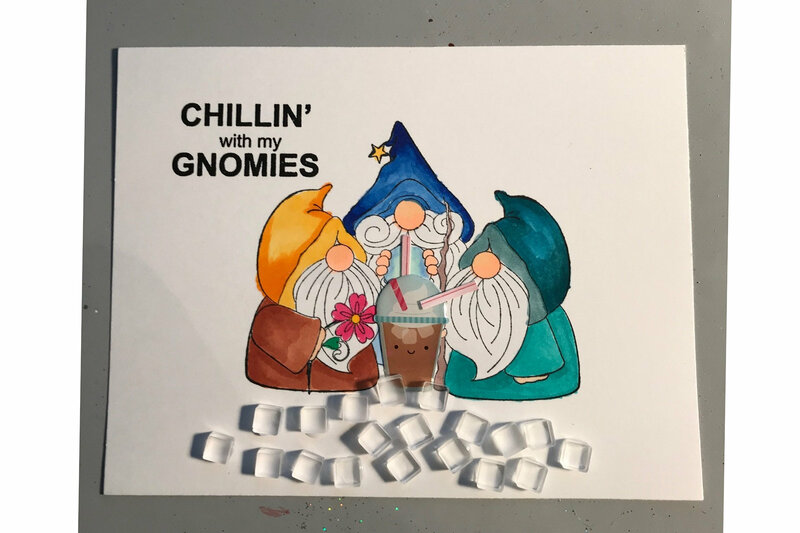 I had bought this Gnome image and sentiment stamp from High Hopes Rubber Stamps, just because it appealed to my sense of humour. 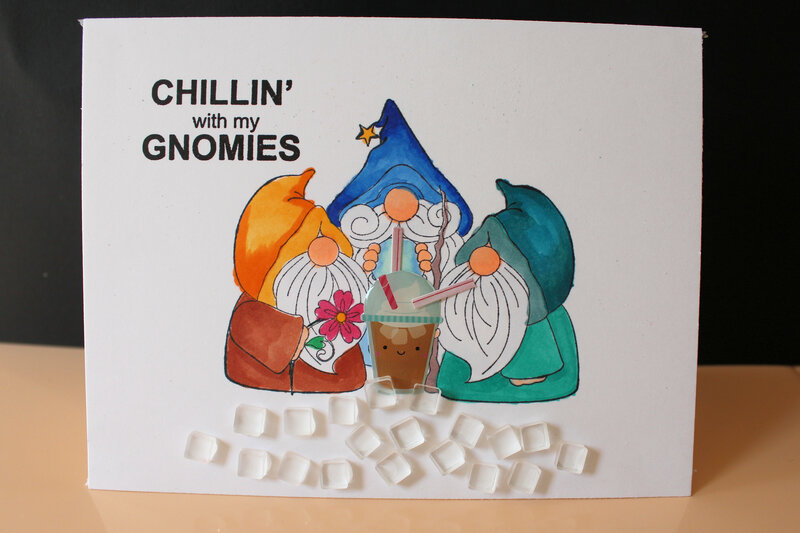 I was thinking about how to make sure the card had a spring/summer feel when I thought of the Gnomes stamp. Sure enough one of the “Garden” gnomes is even holding a flower. When I finished the card, I thought it needed a little somethin somethin. Then I remembered these insanely cute “ice cubes” from My Favorite Things. The iced coffee is a Sprinkles from Doodlebug and the straws are from Jolee’s by You. People often ask, “What jumpstarts your creativity?”. Now people usually reply with answers like an inspiration photo, or a challenge sketch, but not me. I am motivated by the desire to feel less guilty about my stash, by using something that has never come out of the package. Such is the case with today’s card. I had to have that die of a toaster and toast, but really, it lacks the versatility of the dies I usually gravitate toward (thank you, Captain Obvious!). I found it in my stash, and decided it had to be used…… today. 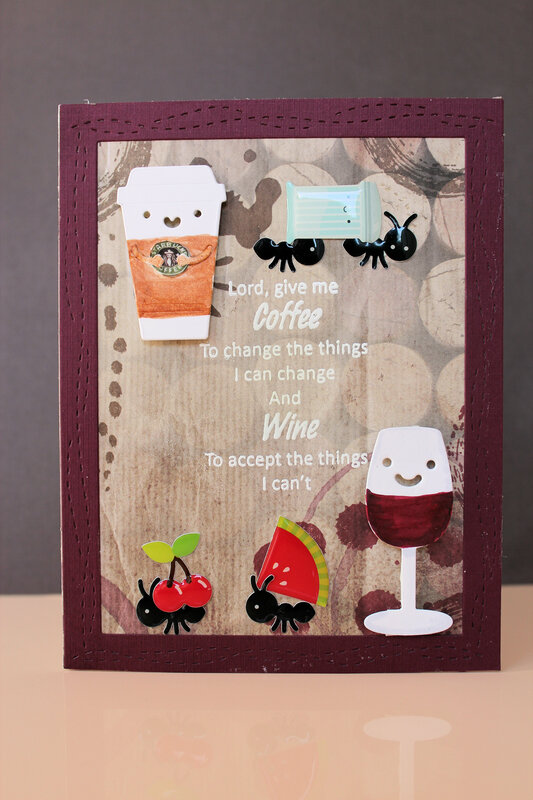 I paired it up with a coffee cup from some Stampin Up paper that was sitting on my desk. The hunt was then on to find a sentiment that captured the feel of the little breakfast scene. I like the look of the metallic toaster and it just might show up again paired with a metallic looking expresso maker or a French press coffee pot. Look at that, that little toaster is versatile after all. Today’s card was based on a die set from My Favorite Things. I tried a number of things and nothing seemed to work. In fact, I tried one thing twice and nope it didn’t work. That is the definition of insanity isn’t it?……………………………….doing the same thing over and over and expecting a different result. Finally, I came up with something I liked. Now if I hadn’t been impatient and stuck my finger in the wet Pico Embellisher, it would have been better but, …Oh well. Supplies: My Favorite Things Tea Party dies, Reverse Confetti All Framed Up Die, Paper House Colorways patterned paper, Pico Embellisher, Stampendous embossing powder, Neenah card base, Tim Holtz distress ink (Vintage Photo), Hemptique twine, Simon Says Stamp sentiment from Coffee and Tea stamp set and Scor tape.